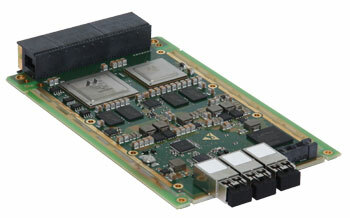 Elma, and partner Interface Concept have introduced the model 4590a 3U OpenVPX Ethernet switch. The 4590a is a high-performance layer 3 switch imple­menting two Ethernet switch matrices that control and physically separate the Control and Data Planes for highly secure network communications. Along with two Ethernet packet processors, managed by a Dual Core ARM processor and industry acclaimed Switchware network management application and graphical user interface, the 4590a offers remarkable switching capabilities plus multiple 10GbE and 40GbE Ethernet configurations in copper and fiber. The 4590a is VITA 46.11 compliant for VPX Chassis Management and includes an IPMI (Intelligent Platform Management Interface) micro-controller supporting the VITA 46.11 system management standard. It is available in air-cooled and con­duction cooled versions. The 4590a is compatible with slot profile SLT3-SWH-6F1U7U-14.4.14 and conforms to the requirements of ANSI-VITA 6.0 MOD3-SWH-6F1U7U-16.4.15-n. SOSA (Sensor Open Systems Architecture) profiles are defined in accordance with the CERDEC CMOSS (C4ISR Modular Open Suite of Standards) requirements for the DoD hardware con­vergence program. The 4590a may be purchased separately or as part of our CMOSS / SOSA Development Platform. Elma provides all sales and support ser­vices for Interface Concept at our Horsham, PA facility.